Yes, dear reader, the title isn’t an exaggeration: I’m thinking carefully about what I want to hold through Standard’s rotation in seven months or so. I never want to get caught with too much Standard as rotation approaches, and if I bought in on something that I haven’t yet moved, I definitely want to be ahead of the pack when it comes to selling out. Before we go too deep, let’s take a moment and reflect on the timing involved. Let’s face it: the summer before rotation, soon-to-be rotating cards get crushed in terms of their value. That often presents some awesome opportunities for buying cards that fell too far, but I loathe being caught with excess copies in July. Glorybringer fell from $6 to under a buck. Ouch. Hazoret the Fervent actually hit peak price at this point in its Standard life, but now it’s fallen from $20 to $4. 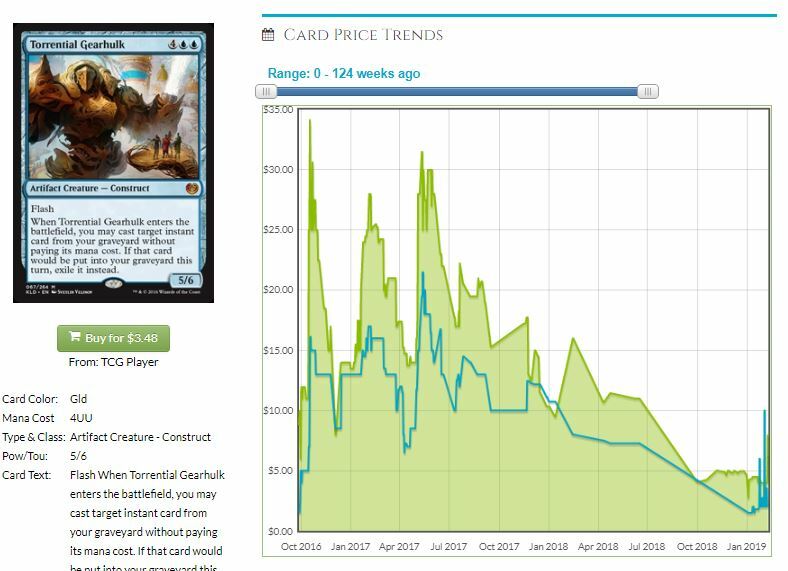 Torrential Gearhulk was above $15 and is now $3. Get the picture? For us, this means that if we’re not playing with a card right now, it’s time to move on all singles except what we are playing with. There’s a lot of time left in Standard, from a Magic viewpoint. The Magic Finance viewpoint, though, points out that now is the time to get all the value you can for a long list of cards, but today we’re going to focus on Ixalan block. Yup, now is the time to move all but your last four, and I’d be okay if you kept two. There aren’t many decks running the full playset but it’ll still be a force in Standard these last few months. Occasionally, someone has 1-2 of these in a TitanShift deck in Modern, but that’s few and far between. The Tyrant, by Thanksgiving, will be under ten but above five bucks. It’s too popular in Modern and Legacy to lose too much value. The decks that want this effect REALLY want it and it comes down so blessedly fast that you don’t lose much tempo. 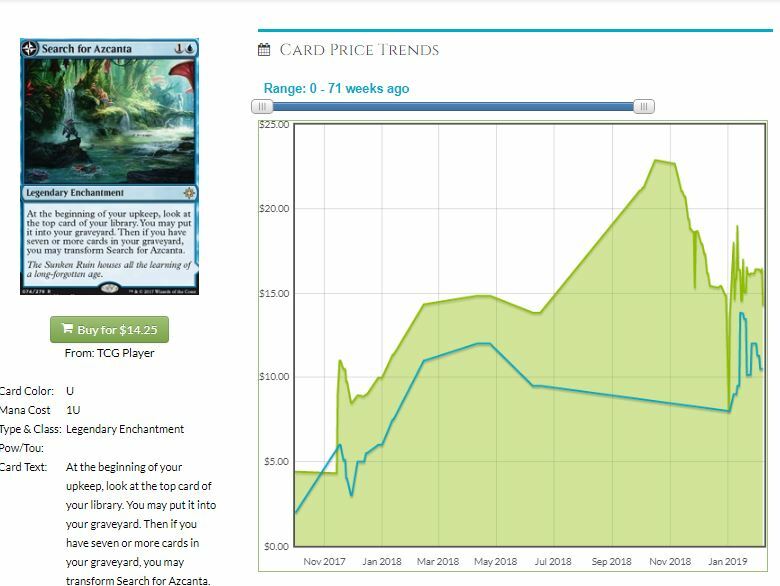 I like picking up the buy-a-box promos in the $50-$60 range, because when the spike comes on, we’re going to hit $100 or more on the Mapsterpieces. 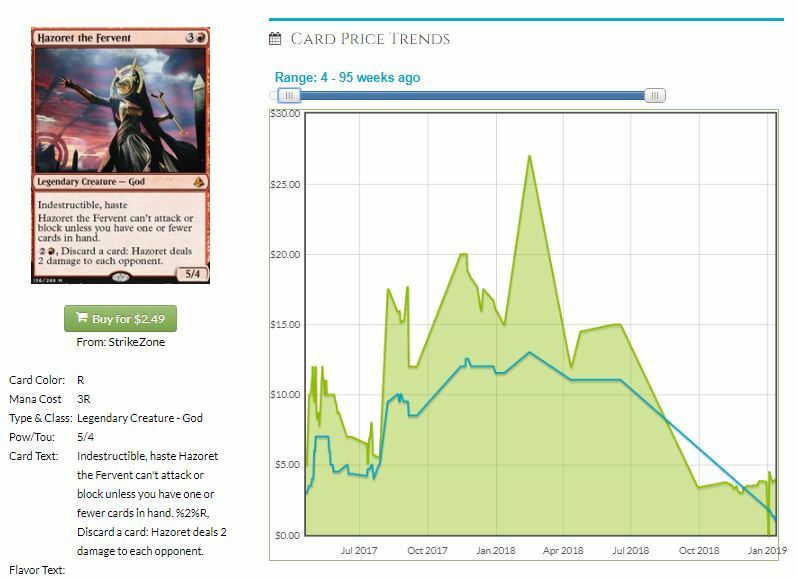 It’s not played in other Constructed formats, and if you want to pick up foils cheap on hopes of future Commander spikes, I think you’re being too optimistic. I’ll give you that it might be the most flexible instant available, and exiling is relevant, but it’s too niche for me. This was a $1 card for quite a while and it’ll go back to being bulk in a few months, Keep the few you play and move the rest right the hell now while you still can. I was really hoping that this was played in some Modern decks, or some Commander, but nope. Very very niche, not commonly played. You’ve got better choices in how to draw cards in artifact decks and this has no future after Standard. Time to move on, matey. While the card is played in only 1400 EDH decks, and I’d play it after I had Kjeldoran Outpost, it’s a solid token card in decks that want the chance to rebuild after the endless board wipes. I think there’s a future here, so foils are what I’ll be getting as the price withers away. I’m hard-pressed to find a card that shows up as a one-of in the 75.Control decks want to have access to one, and the first one is devastating. The threat of the second and third is effective, and in sideboarded games your opponent will be more careful. It’s a bad rate once they figure out you have it, though, so you don’t want too many. I’m intrigued by the card long-term, but only when it drops to the $2 level. It’s only in 1000 Commander decks online, which makes sense. At five mana you get Hallowed Burial, my favorite wrath effect. 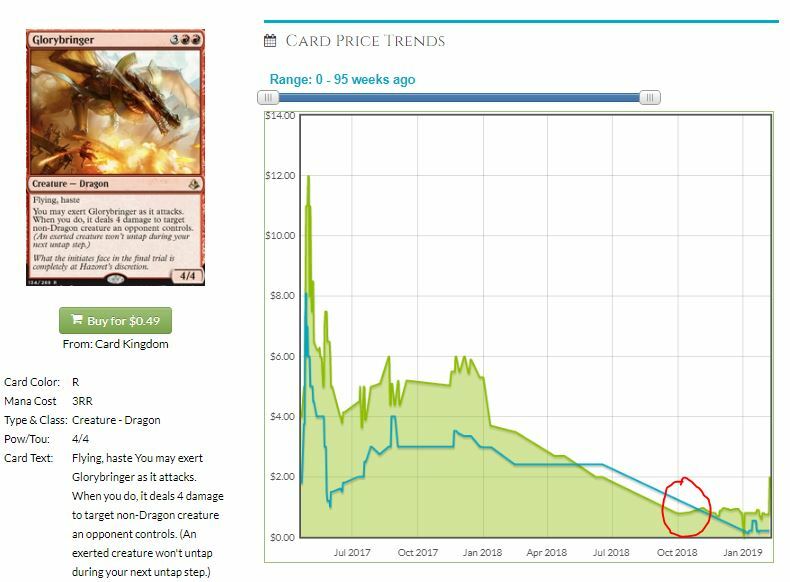 Yes, I think you should hold the $3 uncommon, but the risk of a reprint is my biggest fear. Field is all over the place in Modern, and there are three-color control decks playing three copies. That’s quite a hit for decks to take, especially ones that play Cryptic Command! The plan appears to be to get the one or two basics from your opponent’s deck into play, at which point Field is a Strip Mine and Path to Exile is just a Dispatch with metalcraft active. This is a very easy card to throw into a Commander reprint, but Field foils are already $20. Given the amount of Modern play it sees, that’s actually a very tempting price for me. This is one of my top targets as the summer winds down. I want all of the foils I can possibly have. Tribal decks are all over the place, and this is a very potent enabler, making your team bigger and adding cantrips to each of the tribe’s members. I don’t think this price will go down much, though, because none of the demand is from Standard players. This is already a popular Commander card, and that’s what has the price this high without a speck of Constructed play.